This quick tutorial is going to show you how to add a folder to Nautilus file browser ‘Places’ sidebar in Ubuntu 13.04 Raring Ringtail, Ubuntu 13.10 Quantal. 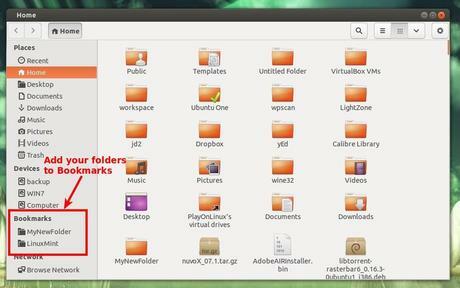 If you’re on Ubuntu 12.04 Precise with Nautilus 3.4.x, use menu Bookmarks -> Add Bookmark instead. Yep, but how about exact Places list, not bookmarks?